If you are a Firefox user you most certainly have come in contact with the browser's about:config dialog that displays advanced configuration settings and preferences. Most of the preferences listed here are not displayed in the browser's options menu that you can open from within the interface. Update: Mozilla switched to a new extension system in Firefox 57. The new system limits what extensions can do, and one of the limitations is access to internal pages. The extension reviewed below, and the linked extensions, are no longer compatible with Firefox and no longer available as a consequence. Add-ons make the preferences listing more accessible. You can for instance install Gui:Config to make available the majority of preferences in a configuration window. Probably the biggest issue that you will run into is that the browser itself does not display information about the preferences on the about:config page. If you do not have an extension like What's That Preference installed, you either need to know the preference and the values it accepts, or search for information on a search engine like Bing, Google or DuckDuckGo. 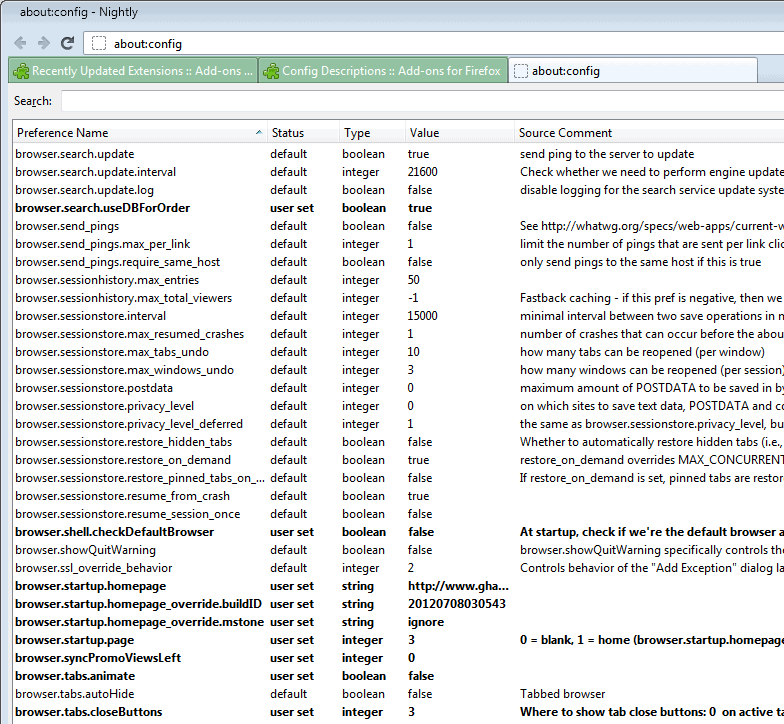 Config Descriptions is a new add-on for the browser that adds comments to many about:config preferences. When you open the about:config page after installation of the extension, you will notice the Source Comment column that it has added to the table here. The comments may offer a description of a preference, or display the various values that you can change a preference to. As you can see from the screenshot above, not every preference has a comment attached to it. The majority of preferences though have and most of the descriptions help you understand what a preference is all about. Extension preferences on the other hand do not offer comments, as do some of the regular browser preferences listed here. You'd still need to use a search engine to find out more about those then, but the frequency of those look ups should be reduced greatly after installing the add-on. If you are a Firefox user who likes to tinker with those advanced preferences, then this extension is a must have. Thanks. Most useful. Now if they only have something like this for Windows Registries. Thanks. I had to use startpage to search for the proper value of a certain preference a few weeks ago. This should make things more convenient. To bad the developers didn’t include this in the browser by default. Didn’t know about these nice extensions to show descriptions of the about:config entries… Thank you very much! Is there a way to permanent zoom in Firefox without using addons ? . I once used the zoom.minPercent and zoom.maxPercent and one other setting which had to be changed to false , but it doesn’t work anymore . I don’t know how to do this w/o using addon. But I’m using NoSquint addon for years and really love it ! After many years of waiting for the Chrome browser to implement color management, (I’m a photographer that needs this), I’ve given up and have recently come back to Firefox. Articles like this have become invaluable to me as get back into tweaking Firefox to my needs. Thanks a bunch and keep ’em coming. “Invaluable” is a good word to use here. Thank you Martin. Once again you provide VERY practical information presented very clearly. What is the difference between regular weight and bold entries in about:config? Bold entries have been modified by the user of the system. I just read this article and as time as passed and Firefox evolved the add-ons are no longer existing. Did somebody could help me finding something for replacement? Hi, Mozilla changed the system. I have updated the review to reflect that. There are not any extensions to my knowledge that offer the functionality. You can load resource files directly though, but it is not as comfortable.